Built for small businesses, sole traders, and freelancers. Create your first invoice in 1 minute. 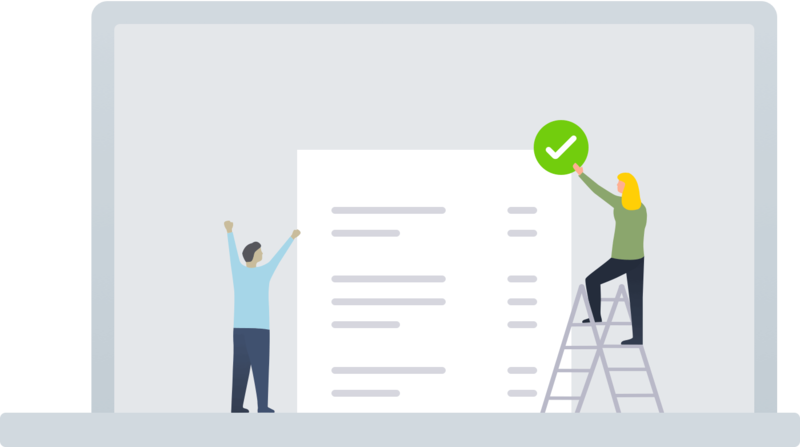 Designed to be intuitive and grow with your business, Debitoor makes invoicing uncomplicated with customisable invoice templates you can send directly to your customer. Keeping track of the status of your invoices has never been easier. Debitoor lets you know the moment your invoice is opened and viewed by your customer and updates the payment status. All of your documents stored securely in the cloud. On-site with a customer? 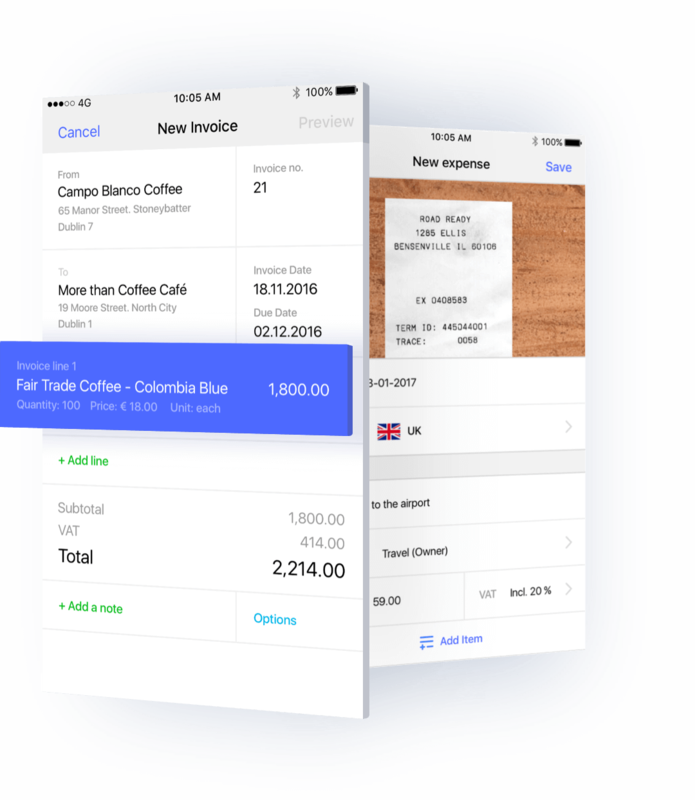 Access your invoicing and enter payments from anywhere, on your computer, tablet, or mobile. 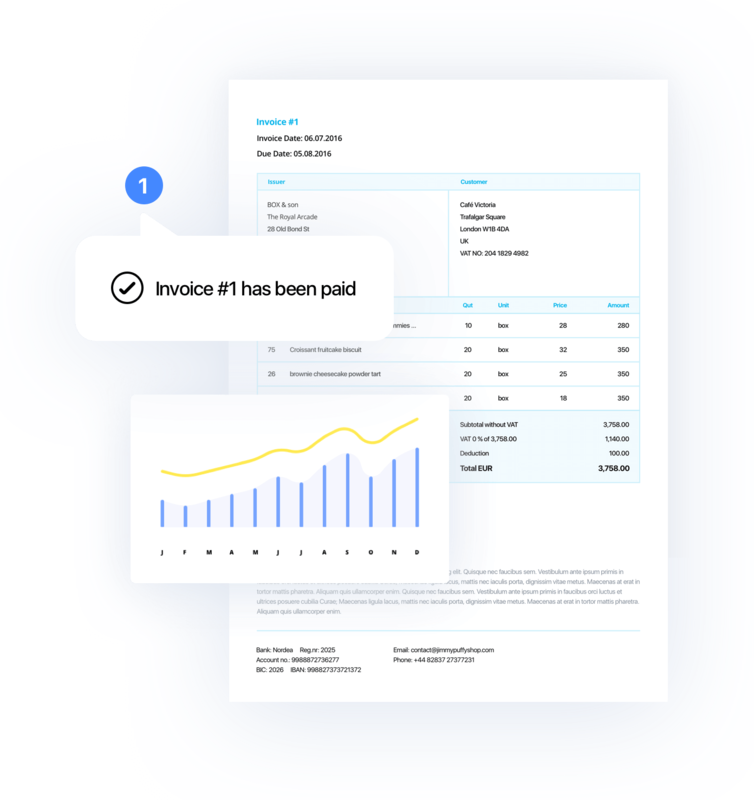 Create your first invoice in less than 1 minute with easy-to-use invoice templates, send it to your customer, and get paid fast with invoicing software. Keep track of your invoice status at a glance. 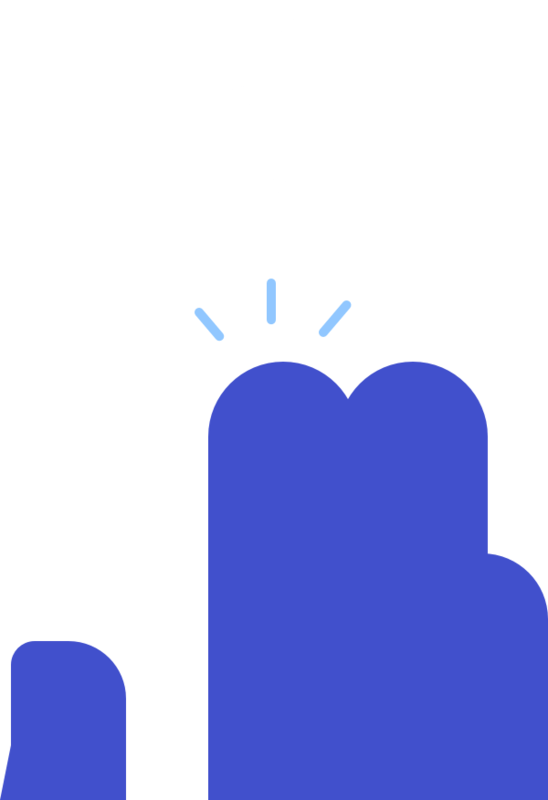 You're notified the moment your customer views your invoice. Enter payments and send late payment reminders with a click. Giving you the tools you need for your invoicing, all in one place with Debitoor invoicing software. Customise your invoices to take them to the next level and stand out from the competition. No more tedious Word or Excel invoice templates - professional invoicing can be easy with Debitoor. Add a personal touch to every invoice by uploading your logo or your own photos and choosing a colour-scheme to suit your unique brand. Select the layout that works best for your invoices, from classic to elegant, to full banner photos. It's possible with just a click. 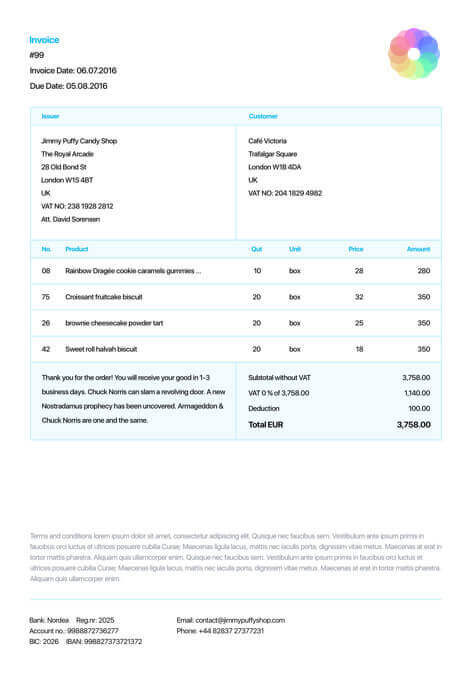 Create beautiful invoices with our professional invoice templates. Improve your sales process with quotes and delivery notes through intuitive invoicing software. The billing software gives you the tools to stay on top of your payments - both expenses and income trends in a simple and straightforward way. The best billing and invoicing software for your business is one that is flexible and can grow with your company. Easy invoicing options allow you to add discounts for your customers and follow-up on unpaid invoices. Start your free invoice software trial now for 7 days to see just how easy it can be to create and send professional invoices fast and track what you spend and receive. Debitoor lets you invoice from your Android or iPhone as easily as from your computer in the office. More than just invoicing: record your expenses and access customer details all from your mobile or tablet, even offline. All the power of cloud-based invoicing and accounting software for your business available in the palm of your hand. Say farewell to paper chaos. Staying on top of your accounting has never been easier. Create an expense by snapping a photo with your phone on the mobile app or uploading a file from your computer. Your document is uploaded to your invoicing software and attached to your expense, stored in the cloud. Choose the right category each time with the clever auto-suggest feature. It presents the category for your expense automatically as soon as you begin to type out a description. Matching payments to invoices or expenses is automatic with the smart bank reconciliation function. Reduce the hassle of balancing your accounts by letting Debitoor accounting & invoicing software take care of it. The latest technology reads your photo or uploaded receipt and automatically fills in the important details. The date and amount are entered instantly in your expense. Keeping up with costs is easier with invoicing & accounting software. 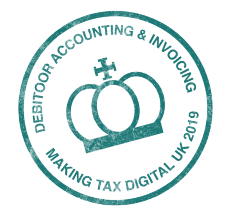 It's easy to connect to HMRC to directly submit your VAT return with Making Tax Digital software online. Under HMRC's new digital initiative, UK businesses over the £85,000 threshold will need to use approved software to submit VAT returns online. Debitoor makes it easy to record and manage VAT, preview your VAT return, and submit it directly with just a few clicks. Record your expenses, manage your payments and monitor your tax with our easy-to-use accounting tools. No background in accounting? We’ve automated some of the main accounting tasks to make taking care of your business finances easier than ever. Generate powerful reports instantly to gain an understanding of your business finances fast. Your VAT, P&L, and balance sheet can be ready with a click. Get the most out of your accounting & invoicing software by inviting your accountant to work directly in your Debitoor account with their own secure access. Accounting software like Debitoor eliminates the paperwork with the data export function, allowing your accountant to get their work done fast and minimising the back-and-forth needed to take care of your accounting. Manage your invoicing, keep track of expenses, and invite your accountant to collaborate and make sure your business finances are always in order. "I am very happy to be able to use easy invoicing software, where I can easily fill and print my invoices! Loving it!" "I have found Debitoor invoice software to be excellent, I wouldn't hesitate to recommend it to a friend or colleague." "Ease of use and simplicity in an invoicing software." "Debitoor invoicing software is so simple and easy to use, it helps me keep track of my day-to-day business accounts even with no accounting experience!" "Easiest invoicing software I have ever used. No fuss and does exactly what it needs to do! In this way I have more time to focus on my web development business!" "I had no idea how to do an invoice before Debitoor invoicing software - it's very simple and looks so professional!"